Once each year the historic religious site comes to life as hundreds of thousands of live music fans converge on the plaza. Many arrive early, camping in the square to claim the best seats. This year’s event drew a crowd estimated at more than one million spectators, largely due to the special appearance by legendary rock singer Vasco Rossi. 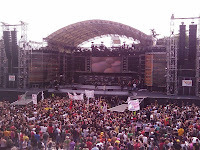 In addition to Rossi and his band, performers for 2009 included Edoardo Bennato, Alessandro Mannarino, Robben Ford, Caparezza and Subsonica. Featuring 30 different bands in total, the event was broadcast live throughout Europe on RAI to another estimated four million persons. As it has for the past several years, Madema exclusively handled all concert sound reinforcement duties for Primo Maggio. The company’s event sound system design featured a total of 127 VERTEC system enclosures. The main PA system was formatted as a left-right configuration of 18 enclosures per side, comprising VT4888DP-AN midsize powered line array elements with DrivePack® technology, with three additional VT4888DP-AN line array elements provided for front fill. The main arrays were each flanked by 12 VT4880 full-size arrayable subwoofers, flown in arced companion arrays. For additional low-frequency reinforcement, 24 VT4880A ultra-long excursion ground-based subwoofers were spaced along the front of the stage. All non-powered subwoofers were driven with Crown Macro-Tech MA5000VZ power amplifiers, and a total of 700,000 watts of peak power was available for the overall system. The Madema team utilized Harman’s HiQnet™ System Architect™ software for configuration and control of the system. This user-interface platform gave complete access to onboard DSP and amplification channels across the entire system of nearly one hundred networked devices, whether traditionally-powered passive subwoofers or internally-powered full-range speaker arrays. To reach additional listeners in the spacious, 40,000 square-meter (430,000 square ft) listening area and surrounding boulevards, Madema also set up four delay towers of 14, 12, eight and six VT4888DP-AN line array elements. With such a huge crowd onsite, an asymmetrical audience area, and placement constraints due to the plaza’s historical architectural features, the largest delay tower had a throw requirement of nearly 200 meters (660 feet), a challenge for any loudspeaker system. Madema’s equipment selection and system design approach met the challenge. the show. Madema's Stefano Brugiotti managed wireless radio-frequency systems, Luca Molinari was in charge of the complex stage monitor system, and Moreno Zamperini of Audio Equipment handled user-interface and network management issues. The audio team from Madema maintained a multi-day presence at the outdoor show site. Stage setup for the huge event began on April 26th, with scaffolding towers, FOH mix position and cable runs put in place on April 27th. The VERTEC system was flown and adjusted on April 28th. Two days of individual artist soundchecks followed, in preparation for the marathon concert on May 1 which lasted late into the evening. "Massive, large-scale outdoor entertainment events like Primo Maggio challenge the skills of any rental sound company and crew," noted David Scheirman, Vice President, Tour Sound for JBL Professional. "With this event, Davide Micheli and his team of audio professionals have clearly shown why Madema has earned its reputation as one of the Mediterranean region's premier concert sound system providers." dbx® Professional Products, a Salt Lake City-based manufacturer of professional audio signal processing products and a division of Harman International, has introduced the new DriveRack® PA+, a complete loudspeaker management system that provides state-of-the-art audio signal processing and an intuitive user interface. The DriveRack PA+ is the next generation of the world’s best-selling loudspeaker management system, the DriveRack PA. The original DriveRack PA, known for setting the standard for complete speaker management, has given thousands of users an easier way to make their speaker systems sound better than they ever imagined. The new PA+ builds on this strong reputation by staying true to its predecessor while providing more great features and improved functionality. The DriveRack PA+ includes a new, updated library of stored speaker and amplifier settings. These built-in settings are a time saving feature only found on dbx DriveRack products. Having the settings included in the DriveRack eliminates the need for users to enter their own speaker settings during setup. A convenient USB connection has also been added that will now allow users to update the preset settings. Other new features include fulltime RTA, front panel mute buttons, a faster Auto EQ® Wizard, and an enhanced Setup Wizard process, which now includes a new, industry-first Auto Level™ Wizard. Setup Wizards have set the DriveRack line of products apart for years. The DriveRack PA+ Wizards enables even less experienced users to set up a system that will sound like a seasoned audio professional tuned it. 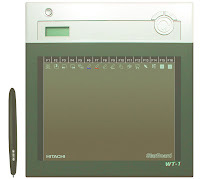 Hitachi Software Engineering America, Ltd. today announced the introduction of the new StarBoard WT-1 Interactive Wireless Tablet, providing educational facilities and corporate environments with the latest in presentation technology. The new tablet comes equipped with an interactive pen with two customizable buttons, and will debut at InfoComm 2009. The new WT-1 tablet provides presenters with the ability to create interactive and dynamic presentations. The WT-1 features a range of up to 30 feet by deploying RF technology, and has a battery life of up to 16 hours of continuous use. The tablet includes 16 shortcut function keys, handwriting recognition, search engine integration, and a built-in LCD indicator screen, alerting users of available battery life. Volume control from tablet to computer as well as the ability to advance PowerPoint slides with a function button provides the user with full control. The tablet’s pen also features two shortcut options. Additionally, presenters have the ability to connect up to seven WT-1 systems to a PC. “We have taken a great product and made it even better with the WT-1. Its development represents our commitment to provide the most interactive and productive presentation systems to educators, presenters and businesses. We are confident that users will find the WT-1 as a great addition to other Hitachi presentation tools and that it is a great solution for any classroom, training room, lecture hall, or media conferencing system,” stated John Glad, product manager for Hitachi Software Engineering America, Ltd. The compact, StarBoard WT-1 Wireless Tablet is just 10.9” H x 11.1” W x 0.8” D and weighs approximately one pound. The WT-1 tablet also features a writing resolution of 2000 Lpi. The StarBoard family of products includes the StarBoard FXDUO series of interactive whiteboards and the StarBoard T-Series interactive panels with applications in lecture halls and training rooms. These products provide presenters and teachers with the ability to interact with the class, while manipulating the screen. With decades of history in downtown Kansas City, Missouri, The Midland by AMC recently re-opened its doors after a renovation process that included installation of a new state-of-the-art sound system featuring JBL VERTEC® line arrays by systems integrator DSS (Digital Sound Systems) Inc. The theater, a longtime fixture on Main Street since 1927, has hosted performances by top artists like Jerry Seinfeld, Bob Dylan, James Taylor, and Duran Duran. The newly revamped venue will continue to provide entertainment for the region with a wide variety of musical artists, comedians and family entertainers. Similar to the system installed for the balcony, the floor level PA system features an array of six VERTEC VT4888’s per side, along with four VT4880 2x18” full-size arrayable subwoofers ground stacked on each side. Additional JBL VRX928LA compact loudspeakers are used as front fills while an additional four VRX932LA loudspeakers were installed for under-balcony reinforcement. DSS chose JBL SRX712M’s for stage monitors, with JBL SRX728 and SRX715 loudspeakers in use as side fills. All of the loudspeaker systems are powered by Crown I-Tech 6000 amplifiers and were configured with Harman HiQnet™ System Architect™ software. 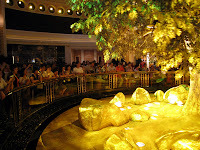 An invigorating show of both serenity and extravagance, the Tree of Prosperity attraction at the Wynn Macau resort hotel and casino in Macau, China is an award-winning, multi-sensory experience. Joel J. Gread Associates, Inc. (JJGA) served on the show design team as the audio/video/control (AVC) engineering consultant. Conceived to excite resort guests with a show of theatrical excellence, the Tree of Prosperity’s sound system features a variety of JBL loudspeakers. Electrosonic Systems, Inc. (ESI) installed the AVC system, supporting the project out of its Burbank, California and Hong Kong offices. The Tree of Prosperity show features spectacular movement of kinetic sculptures, video, lighting and dynamic music. The Wynn’s atrium, where guests first arrive on their visit to the resort, depicts Chinese and Western astrological symbols on upper and lower domes. The show begins with thunderous music as the upper dome opens, revealing an abstract light show on a massive video screen above. The screen soon splits in the middle as a huge crystal chandelier descends. The lower dome then opens as a 38-foot tree ascends from below. The stunning Tree of Prosperity’s 60 limbs have 2,000 branches and 98,000 leaves made of 24k gold and brass leaf. Audiences are amazed and thrilled throughout the presentation. Originally, the Tree of Prosperity show had no existing sound design concept other than a generic single point-source track used for preliminary visual concept presentations. When JJGA designed the audio system, with input from JBL Professional, principal engineer Joel Gread specified a configuration of eight AM6340/64 full-range loudspeakers, recessed above the outer atrium ceiling. An additional eight ASB6118 subwoofers are co-located with the AM6340’s, while four AC2212/64 full-range loudspeakers are aimed virtually straight down from high above the audience, providing aural effects associated with the crystal chandelier. Lastly, there are four Control 29AV’s playing audio from the rotating base of the golden prosperity tree. The eight AM6340/64 loudspeaker systems each have discrete audio sources and amplification, configured as four alternating left-right stereo pairs. Sound effects such as a sweeping wind effect are sequenced during the show at appropriate moments. Powering the loudspeaker systems are Crown CTs series amplifiers, each with an IQ Network DSP-based programmable input processor. There are five CTs 600, nine CTs 2000, and five CTs 3000 amplifiers, all with IQ-PIP-USP2/CN. For Macau, Crown provided amps in 220V versions. Adding even more value to its lineup of portable PA loudspeakers and studio monitors, JBL Professional is offering substantial rebates and free gear offers on several of its industry-leading loudspeaker models. These offers extend to the LSR4300 Series studio monitors as well as the PRX500 and MRX500 Series portable PA loudspeakers. 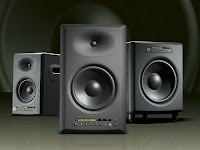 Purchasers of LSR4300 Series studio monitors qualify for cash-back rebates of up to $200. Each purchase of an LSR43212SP subwoofer qualifies for a $125 rebate; JBL is offering $150 cash back for purchase of a pair of (2) LSR4326P studio monitors and $200 cash back for each purchase of a pair of (2) of LSR4328P studio monitors. Rebates on LSR4300 Series monitors are available for purchases between May 1 and June 30, 2009. With the purchase of a pair of (2) PRX500 Series portable PA loudspeakers between June 1, 2009 and July 31, 2009, users can receive a free dbx DriveRack PX made by JBL’s Harman sister company. Additionally, a $50 rebate is available with the purchase of any MRX500 Series loudspeaker between June 1, 2009 and July 31, 2009. In a significant audio upgrade project at the Evangelical Covenant Church in Grand Rapids, Michigan, the first Soundcraft Si3 digital console sold to a House of Worship was recently installed to help deliver better quality sound for the 750 worshippers who attend services and participate in ministries every week. The church has been established in the Grand Rapids neighborhood since 1979 and continues to uphold the history of The Evangelical Covenant Church. The church decided to upgrade the audio system after their original analog system started to deteriorate; a 48-channel analog mixing console was originally installed in the church, the digital Si3 replaced it with minimal infrastructure changes, immediately providing 64 input channels. LaPorte and the other engineers at the Thornapple Church are extremely satisfied with the Si3 and they have taken advantage of its ability to store presets from previous sessions. This capability, along with cue and recall settings, are an integral part to any event at the church and helps eliminate sound variances between individual sound technicians preferences and allows flexibility to their FOH engineers to quickly restore audio order if the church service does not follow script. “We purchased the Si3 console a few weeks before our biggest production of the year,” continued LaPorte. “Once we had the initial programming and audio adjustments for the sanctuary set, we began to program the services and show. Les Ruster, our senior technician, created a different cue for each of the 45 different scenes in the production. On the night of the show, all he had to do was press the next cue button to jump seamlessly between the many different settings that the acts required. These features really made this show our best show ever from a technical perspective,” added LaPorte. In an effort that addresses the needs of Mac users in the educational community, Hitachi Software has released StarBoard Software 9.0. The software makes the Hitachi StarBoard a viable tool to the community of users that have been searching for an optimized interactive whiteboard experience with Mac hardware. Featuring a highly interactive interface, StarBoard Software 9.0 was designed with an eye on the industry wide trend surrounding operating systems that are migrating towards operations utilizing touch capability. The software’s icons are more intuitive and provide users with a natural sense of functionality. Hitachi StarBoard Software 9.0 for Mac offers users similar functionality as its Windows version, including additional features. A new live desktop mode allows users to ink on YouTube™ videos or any animation on their computers without having to take screen shots or freeze frames. Additionally, a user can drag tools from the toolbar and drop them onto a page offering a more customizable interface. For example, this feature allows a math teacher to place a protractor tool directly on a page so a student has the ability to activate it easily, as opposed to navigating through the menus. The software also allows FX DUO board users to perform multi-touch gestures, such as pinching, to rotate and resize images as well as an improved multi-input pad that allows two users to write on the board simultaneously. “The Hitachi StarBoard Software 9.0 is the result of a collaborative effort of our team as well as extensive feedback from our customer base. In launching this platform, Hitachi Software provides users with an easy to use and navigate, comprehensive toolset for interactive, immersive use. Our primary goal was to provide supplemental features to improve this software and provide Mac users with the strongest software solution,” stated Akira Nagamori, director of Hitachi Software. Demonstrating the widespread worldwide adoption of JBL VERTEC® line arrays, regional concert sound rental provider Grupo Zonico supplied the audio system for a recent concert featuring legendary rock band KISS in Venezuela. A stop on the “KISS 35 Alive World Tour,” the show was staged at the 10,000-seat Estacionamiento de la Rinconada outdoor venue in Caracas. Grupo Zonico of Edo Miranda, Venezuela supplied audio equipment as specified by US-based Clair Global, which is currently handling worldwide sound requirements for KISS including the Latin American tour leg. 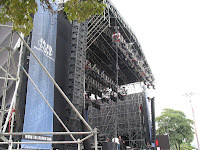 For KISS, Grupo Zonico provided a total of 32 JBL VT4889-1 full size line array elements for the main system. Eight VT4888DP powered midsize line array elements were used as supplemental front fill speakers, while VT4887ADP powered compact line arrays were in use for onstage side fill monitors. “Hugo Morillo and his entire team at Grupo Zonico are an excellent example of how the correct blend of staff, professional skills and equipment can provide veteran international-class acts with the top-tier tour sound performance they have come to expect in larger entertainment-industry markets, regardless of where the show is scheduled to take place,” observed David Scheirman, Vice President, Tour Sound for JBL Professional. Grupo Zonico’s JBL VERTEC system is powered by Crown I-Tech power amplifiers, and signal processing is achieved through the dbx 4800 Loudspeaker Management System loaded with JBL’s new V4 DSP presets. Harman Professional’s HiQnet™ System Architect™ software is used for remote control and monitoring. The company is supported and serviced by MEDIA CA, distributor for Harman Professional products in Venezuela. The recent opening of the brand-new Aliante Station Casino and Hotel in North Las Vegas marked the continued growth of Kelley Technologies as one of the leading A/V installers for casinos in southern Nevada. Kelley Technologies handled the design and installation of the entire audio/video system at Aliante Station, implementing JBL Control® Contractor Series loudspeakers throughout the venue. Located in the expanding North Las Vegas area, Aliante Station is the latest casino to open under Station Casinos’ ownership, joining other well-known casinos such as Green Valley Ranch, Red Rock Resort and Wild Wild West. Aliante Station features a gaming area, with 2,000 slot and video poker games, more than 40 table games, a poker room, a high-limit room, and a state-of-the-art Race & Sports Book. The hotel boasts 200 hotel rooms, while the property also contains six restaurants. Kelley Technologies has a longstanding relationship with Station Casinos, having installed systems in several of the company’s locations, and the A/V system at Aliante Station showcases the continuation of a successful formula. As with most of Station’s casino properties, the race & sports Book area at Aliante Station serves as the head end for distribution of the A/V system. In keeping with the philosophy of most casinos, the audio system needed to be conducive to creating a comfortable environment where customers would enjoy the gaming experience. “The goal at Aliante Station was to provide crystal-clear, atmospheric sound while simultaneously making sure the audio equipment maintained a low profile,” said H Waldman, project manager for Kelley Technologies. To create this balance of adequate sound and discreet appearance, Kelley Technologies found the JBL Control Contractor Series to be an ideal solution. And while the audio components are largely out of plain view, Aliante Station is nonetheless a showcase for the versatility and quality of the Control Contractor Series loudspeakers, which are dispersed throughout the casino and hotel. In all, the system features a total of 754 Control 227CT medium-format, in-ceiling loudspeakers, 983 Control 25T surface-mount loudspeakers, and 232 Control 28T-60 surface mount loudspeakers. Crown CTs amplifiers power the system, which also includes processing from BSS Audio BLU 32 and BLU 80 components. For more information on Kelley Technologies, please visit www.kelleytechnologies.com or call 702.889.8777. Offering superior performance and reliability, Hitachi Home Electronics (America), Inc., Business Group has introduced the Hitachi CP-X2510 3LCD projector. The CP-X2510 features a brightness of 2,600 lumens and a 2000:1 contrast ratio. The CP-X2510 3LCD projector is easy to install and transport at a light weight of 7.9 pounds. The CP-X2510 features 16 Watts of built-in audio, eliminating the need for external speakers, while maintaining a low noise rating of 29 dB in Eco Mode. A hybrid filter allows for 5,000 hours before replacement. Additionally, the CP-X2510 consumes less than 5W power in Saving Mode. The CP-X2510 features a long lamp life of 3,000 hours in Standard Mode and 6,000 hours in Eco Mode. The CP-X2510 also features Hitachi’s proprietary My Buttons functionality, allowing two buttons on the projector to be programmed to execute any projector command. The CP-X2510 offers input Source Naming, allowing users to rename input sources to fit their needs. Closed Captioning functionality is also available with the CP-X2510. The CP-X2510 features a Transition Detector, which requires a password to operate the projector when it is moved from a fixed position. The CP-X2510 also offers PIN Lock and MyScreen functions, along with a security bar that enables the use of a heavy chain to prevent theft. Outdoor concert goers were recently entertained in Delhi by touring French song and dance troupe ‘Breizh Side Soriou’. The 47-member troupe performed through a Soundcraft Si3 digital console and PA company, Dhawan Electrical Pvt. Ltd of Delhi, also supplied a JBL loudspeaker rig comprising VRX932LA compact arrays and SRX 728S subwoofers powered by Crown IT4000 amplification. The onstage monitor system included JBL SRX 712M’s with JBL SRX 725’s in use for side fill coverage.